Catholic universities are not alone in their struggle to balance religious identity and academic freedom. The Dallas Morning News explores how Baylor University – the largest Baptist university in the country – is stepping up to the task under the leadership of its new president, former Whitewater prosecutor Ken Starr. It seems the Texas university is discovering that committed religious identity and academic excellence are not mutually exclusive. “At Baylor, we believe fervently in academic freedom and we do not flinch from the truth,” said Starr, referring to the fact that, unlike many more conservative religious schools, Baylor teaches evolution and other biblically sensitive topics from a scientific perspective, as it always has. In 1990, after a decadelong fight between fundamentalists and moderates in the Southern Baptist church, Baylor’s charter was changed to restrict the Baptist General Convention of Texas’ board representation to 25 percent, effectively taking Baylor out of the strict control of the Baptists. This meant the end of any talk of teaching courses based on the Bible as the inerrant word of God. Many faculty members and alumni also believed that this event would mark the beginning of secularization, a process that had transformed other once-prominent Baptist institutions, including Brown University, the University of Chicago and, most recently, Wake Forest. In fact, the reverse happened. The charter change – which blocked a fundamentalist takeover of the school – actually freed Baylor to reassert its Christian identity. In 2002, it embarked on an ambitious plan, known as Baylor 2012, whose goal was to completely alter the character of the university. 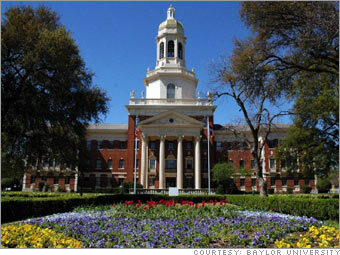 Baylor had long been content to be primarily a low-tuition teaching university for children of Texas Baptists. Professors did not publish much and were generally not leaders in their fields. Under Baylor 2012, all that would change. Faculty would teach less and publish more, and their tenure would depend on it. The university would also greatly expand its graduate schools. The largest building campaign in the university’s history would add whole colleges and academic buildings. Students would come with improved boards and grades. The idea was to move the university’s ranking from the mid to high 70s in the U.S. News and World Report list into the top 50, the cutoff for “Tier One” status. The university’s second and far more controversial goal was to reaffirm its Christian mission, which meant hiring only faculty members who were not only Christians, but also deeply committed to their faith. (Roughly one-third of Baylor’s faculty and students are Baptist these days.) Though Baylor’s Christianity is visible in many ways, from mandatory chapel attendance to the abundant school-sponsored mission programs in the U.S. and abroad, the school’s religious character resides primarily in its faculty. The result, in 2002 to 2005, was a small civil war inside the university that centered on President Robert B. Sloan Jr., the man whose vision Baylor 2012 had been. Sloan declined to comment for this story. The primary issue was the wrenching change in the faculty, both in the insistence on research and publication and in the often confusing new religious standards, which many interpreted as a doctrinal litmus test. Prospective teachers were grilled about their Christian convictions, and the existing faculty was split into “A” and “B” groups, separating the newly favored “research” types from the teachers. Sloan was soon at war with both his faculty and his alumni association; he received two votes of “no confidence” and resigned under fire in 2005. For a while, it seemed that what the many skeptics had said was true: Baylor could never be both Christian and a great academic institution. Slowly, quietly, the main precepts of the 2012 plan began to take hold. The number of faculty with degrees from top-flight research institutions rose substantially, as did their rate of publication. In departments like sociology, Baylor managed to land world-class faculty members who were also Christians. In 2002, the number of faculty articles in major publications was 202; by 2008 that number had risen to 496. Scholarly citations soared, too, as did external grants for research, the number of doctoral programs (rising from 14 to 20) and enrollment in those programs (up 32 percent). Student SAT scores have risen 50 points in the last 10 years, while undergraduate applications rose stunningly from 7,431 in 2002 to 34,224 in 2010. Baylor’s biggest challenge is finding talented Christian faculty members. For many academics, the prospect of being asked about their religion in interviews is not an appealing one.